Another version of the space gun involves air pressure to launch a payload in to space through a barrel. While this system is certain not to be as violent a timed explosions, a major problem involves the compressibility of gasses, which will have serious effects on the rates of acceleration that could be obtained. One possible solution is to increase the barrel length, but the corollary is that a longer barrel requires more propellant gas, which is also compressible. The trade-offs between barrel length, payload diameter and mass, type of propellant used and how to deliver it to the barrel, and many other factors still need to be worked out. Unfortunately it seems unlikely that pneumatic launch systems will be effective for use with massive satellites and other payloads unless the compressibility issues of propellant gasses can be worked out. 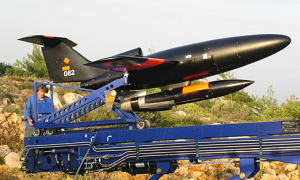 Learn more about Pneumatic Launch System.